THIS THREAD HAS A LOT OF SPOILERS INCLUDED SINCE IT REVOLVES AROUND THE LATEST CHAPTERS/STORY! IF YOU ARE LOOKING FOR A SPOILER-FREE DISCUSSION THREAD, THIS IS NOT FOR YOU. Discuss the Latest Arc, in terms of Plot & Characters, in this Thread! I'll be doing a series of individual post for each Rum arc character and plot in which I go through everything worth noting about them and summarize my thoughts on it. Wakita Kanenori is the latest "obvious" Rum suspect that was introduced. Many are wondering about whether he could be Rum or not, so I'll be breaking down everything there's to get from his introduction up to this point. So, we all know about Gosho's pattern when it comes to introducing a new character in the story. Other than the normal form of foreshadowing, in which we get info that our main characters are eventually supposed to utilize to get to the truth, there's also the fourth-wall-breaking foreshadowing, in which the foreshadowing is meant for the fans to utilize, and not the in-universe characters. That style of foreshadowing is something that Gosho loves to do and has used it many times through out the series. Very clear and important examples are two characters from the Bourbon arc, Amuro and Mary. In Amuro's introduction case(File 793-794), we had many instances where Gosho was intentionally hinting towards his identity. The first one was the reference to "Bourbon"(793), which ended up being his code-name in the Black organization. The second one was Amuro's "spy" reference(794), in which he was denying of sharing their attributes, but ultimately ended up being one that infiltrated the Black organization. In Mary's introduction case(File 876-878), we also had similar indications of Gosho foreshadowing a part of her identity, or at the very least, her former affiliation. In this one, he was fairly clever with it and hid it well, by splitting the foreshadowing into parts and delivering them in future cases. Although this isn't confirmed yet, both of these foreshadowings indicates that Mary is, or was, an MI6 agent. The first one is the "James Bond"(MI6 agent) reference(878), which is tied to Mary's stunt in File 952. The second one is Mary's gadget experience and amazement by Agasa's work(878) which is tied to Amuro's "MI6" reference in File 895. Similarly to their introduction case, Wakita's introduction case also had foreshadowings but with a variety of implications. If we go through Wakita's introduction case(File 975-977), the first interesting hint we will find is the indirect reference to "Rum". You can see that Gosho was aiming on being less obvious with the "liquor-code-name" reference, compared to the Bourbon arc, as he chose to write "Pirate's Spirit"(which is known to be "Rum") instead(975). At first sight, this does seem to imply that Wakita is Rum, however, this does contradict one major characteristic that has been established in regards to Rum's character, and that is his artificial eye. At the moment, we haven't gotten a confirmation that Wakita does not have an artificial eye, but his behavior and circumstance seems to point to that he doesn't. Wakita wears an eye-patch, which is claimed to be hiding his damaged eye. If he had gotten an artificial eye before ~4 months ago(when Sherry was still in the BO and had a chance to hear about Rum's artificial eye), and since he says "sticking to one place isn't my style", he wouldn't have been allowed to work in the kitchen in all those places he previously worked at(because having one eye while cooking is risky), yet he was still looking for that position, as if he normally did have that position in the previous places. This contradiction implies that the eye injury is likely recent, rather than old. Also, if he really did have an artificial eye and lied about it, then he definitely wouldn't have offered to show his fake eye, like he did(975). There are also the other descriptions about Rum's "feminine" and "strong" characteristics that is yet to be seen in Wakita. Ultimately, there's a lack of similarities between Rum's characteristics and Wakita's, however, that "Pirate's Spirit" reference definitely ties his introduction to Rum and the Black Organization. So who is Wakita then? If we take a look at the context of the "Pirate's Spirit" mention, when it's referenced by Wakita himself(975), we can see an alternate interpretation of that foreshadowing. Wakita said "Pirate's Spirit is such a weak horse... yet you bet so much on it." If you look at this sentence as a foreshadowing to Wakita's position/opinion, in regards to Rum, then you can get this interpretation. If Wakita is a BO member, then this sentence makes a lot of sense and basically foreshadows his antipathy with Rum, as well as his dissatisfaction with the boss favoring Rum. The second foreshadowing references "the boss", and gives us implications of another layer to Wakita identity. This is a very obvious red-herring of making Wakita look like Rum, but this still gives us a strong foreshadowing that Wakita, who was introduced in this case, is someone close to the boss. It's important to note that the translation says "closest", rather than "close". This implies that Wakita might be the closest subordinate to the boss, yet the boss chose Rum as the No. 2(second-in-command). This explains why there might be an antipathy/rivalry between him and Rum and his overall disagreement with the Boss' decision(according to the first foreshadowing). As we know, Wakita ended up being Kogoro's apprentice. If we assume that the foreshadowing-interpretation is correct, why would the closest subordinate to the BO boss become an apprentice to Kogoro? The biggest clue we have is Gin's latest appearance(953), where he referred to Kogoro as a potential threat, after his involvement in the Hotta Gaito case(File 951-953). Gin's suspicion of Kogoro has been developing since the start of the Kir arc. Because of Conan's mistakes, Kogoro became like the face of Conan's secret investigation of the BO, which Gin has slowly started to sniff out since the Vermouth arc(Itakura case). Even after being tricked into believing that the FBI used Kogoro to trick the BO, Gin still held on to his suspicion against Kogoro. The latest development with Gin's suspicion indicated that it was the last straw and that he finally decided to take actions. This could potentially be where Wakita comes into the picture. If Gin is suspecting that Kogoro is investigating Kouji's case from 17 yrs ago, then it makes sense that he would get the assistance of the high-ranked members, as per the Boss' orders, since the case is connected to someone who's currently the second-in-command and it involves a well-known detective(compared to the Rokumichi case in File 954-957). The boss already knows of Kogoro's past-involvement with a BO member(Kir) and would value Gin's new suspicion of Kogoro. Therefore, it's not a stretch for the boss to activate his closest subordinate, Wakita, to verify Gin's suspicion and eliminate the potential threat. This means that Wakita intended to get close to Kogoro, similarly to Bourbon, in order to investigate him. He didn't just "wash up" in Iroha Sushi Restaurant(as he claimed), but specifically targeted it, since it's next to the Mouri Detective Agency. The fact that Gosho addressed what had happened to the former employee indicates, in this scenario, that Wakita caused the traffic "accident" that got the employee hospitalized, in order to take his place. Since Wakita is a fairly new character, we haven't gotten too much development of him since his introduction, but we did get something. In his latest appearance(File 980), we got a panel where we could see him read the latest news and say "This one's, quite quick-witted!". At first sight, what we assumed he was reading is the case with Rumi(in which the headlines made her out to be a hero), since the previous panel showed Kuroda's reaction to that news headline. 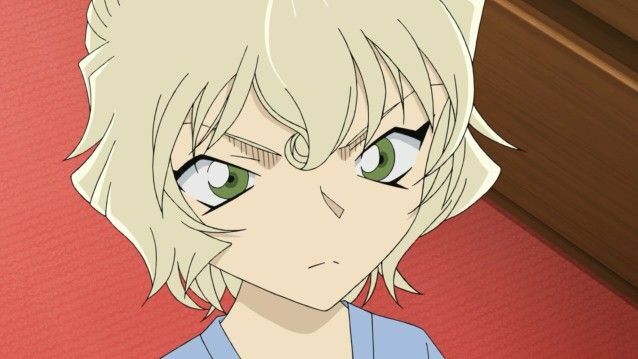 However, because the panel never showed what Wakita was reading, it can be considered as one of Gosho's simple mislead-tactics, to make us think that Wakita found out about Rumi's existence(and her suspicious name). Assuming that he wasn't reacting to Rumi, what was he reacting to instead? I think that the main point to why Rumi's case(File 978-980) referenced "Ikyuu" so much and established similarities between Conan and Ikyuu was because of that last panel. 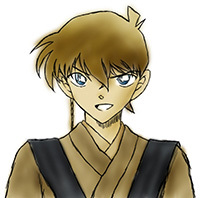 Ikyuu was a monk that was known for his wit, and Conan was acting as Ikyuu at the start of the case. When Shinichi was a kid, he got the "Ikyuu" role because of his similar qualities to him. This does look like Gosho's way of foreshadowing that Wakita was calling Conan "quick-witted", since that is a direct reference to Ikyuu's known quality, which Conan represented. This means that Wakita was reading about Conan, but since the "Rumi case" highlighted Rumi, it's more likely that he was reading an old newspaper about Conan's achievement(like the "Kid killer" news). This could be Gosho's setup to where Wakita eventually becomes the canon version of Irish, the BO member that finds out about Conan's identity. - Wakita could be the BO boss' closest subordinate and someone that has an antipathy/rivalry with Rum. - His goal is to investigate Kogoro and verify if Gin's suspicion is true. - He might be on to Conan right now. Last edited by MeiTanteixX on December 23rd, 2018, 9:29 am, edited 15 times in total. MeiTanteixX wrote: So, I'll be doing a series of individual post for each Rum arc character and plot in which I go through everything worth noting about them and summarize my thoughts on it. Yep, I absolutely agree with this assessment. Though I still don't know why they would need to place another agent, let alone a high-ranking one with a codename, near Kogoro just to spy on him, when they already have something better in place with Bourbon, who is already established as an acquaintance of Kogoro and works in a shop that Kogoro visits far more frequently. Sure, Gin doesn't like Bourbon, but I doubt Gin could get it approved to place another codenamed member there just because of that resentment. And it's not like Bourbon is somehow under doubt after the whole Scarlet arc, since he was also entrusted with the mission to scout out Rokumichi Hado after all. 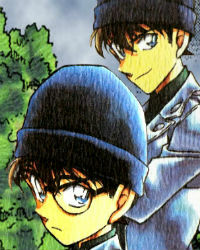 Serinox wrote: Though I still don't know why they would need to place another agent, let alone a high-ranking one with a codename, near Kogoro just to spy on him, when they already have something better in place with Bourbon, who is already established as an acquaintance of Kogoro and works in a shop that Kogoro visits far more frequently. Sure, Gin doesn't like Bourbon, but I doubt Gin could get it approved to place another codenamed member there just because of that resentment. And it's not like Bourbon is somehow under doubt after the whole Scarlet arc, since he was also entrusted with the mission to scout out Rokumichi Hado after all. Is it even confirmed that they know that Bourbon is working in Poirot? I'd assume that in order to not get the Mouri and Conan under the BO radar(as per Vermouth's wish), he wouldn't disclose that info to them. Yeah, back in File 818/Episode 701, Vermouth refers to Bourbon's source of info as just a "3rd party." She didn't specify. If the BO knows he's still at Poirot (or knew in the first place), it hasn't been revealed to us. Well, after the Mystery Train Vermouth talks about how long Bourbon plans to stay close to Kogoro. Vermouths wording here seems to imply that this isn't something that Bourbon has kept from the BO; but even if "you've been saying" is just between the two of them, I doubt that he could go undercover without revealing where. Even Vermouth, who has the most freedom to act on her own in the BO, had to tell the BO about her undercover disguise (hence why Kir frequented Araide's clinic during that time), so I doubt that Bourbon has enough freedom to leave this fact out. 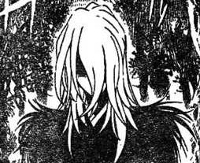 But yeah, since appearances of other BO members aside from Bourbon and Vermouth have become very rare, it's not a clear situation by far, but I'd say we should assume they know about his undercover disguise until some further stuff on that is shown in the future. Also, the 3rd party source was Mitsuhiko's video and not the fact that Bourbon obtained that video from Kogoro's office. Serinox wrote: Even Vermouth, who has the most freedom to act on her own in the BO, had to tell the BO about her undercover disguise (hence why Kir frequented Araide's clinic during that time), so I doubt that Bourbon has enough freedom to leave this fact out. That's just your interpretation. Gin's anger in the climax of the Vermouth arc suggested otherwise,... that they didn't know where or what vermouth was up to(hence why the boss felt like he gave her too much freedom). Since Chris visited the Clinic before, either the BO was trying to follow her tracks or Kir was doing her own investigation. Mhh, Gin indeed didn't know what she was up to exactly, but he was informed of her organizing the Halloween party, so I'd take it as him knowing the basics of her moves, but not knowing her intentions and not being able to make sense of her moves is what made Gin angry. Plus, Vermouth chose Araide as a disguise on purpose, so that she wouldn't reveal in her reports that she was in reality searching for elementary schoolers, to hide the shrinking from the BO, as was pointed out in the Mystery Train, so I think the BO knew of her undercover disguise during the operation; otherwise, the whole charade that also confused Conan in the Teitan High Ghost Story case would've been rather unnecessary. Serinox wrote: Mhh, Gin indeed didn't know what she was up to exactly, but he was informed of her organizing the Halloween party, so I'd take it as him knowing the basics of her moves, but not knowing her intentions and not being able to make sense of her moves is what made Gin angry. Plus, Vermouth chose Araide as a disguise on purpose, so that she wouldn't reveal in her reports that she was in reality searching for elementary schoolers, to hide the shrinking from the BO, as was pointed out in the Mystery Train, so I think the BO knew of her undercover disguise during the operation; otherwise, the whole charade that also confused Conan in the Teitan High Ghost Story case would've been rather unnecessary. The reason to that she disguised as Araide is heavily implied in Teitan High Ghost Story that something was tying her to both Teitan High and Elementary, and that was Ran and Conan, her treasures. She didn't choose Araide because she wanted to mislead the BO, but again, that's just my interpretation. Who knows what wakita has in mind..! It could be him being another red herring(usual) or he could be one of the 3 RUM's that were being said. The muscle man , an old man, and the man with women hairs ! like that !! So chances are wakita could be one of them , thus makes that rumi could be another ! And there is one more more like hyoue kuroda. That's it ! these 3 are the RUM probably. Also, I don't know whether or not BO knows bourbon's whereabouts! But vermouth surely does.! And why wouldn't she be ..! everytime there is BOURBON(specifically) Vermouth sure is near. Tantei San wrote: Who knows what wakita has in mind..! It could be him being another red herring(usual) or he could be one of the 3 RUM's that were being said..
Rum is one person (laugh). Sounds to me like a coincidental technicality. If we're going to find out who Rum is, I don't think a name like "Hitori" is going to be the decisive evidence—at the very least, on its own, it isn't. During wakita's introduction, The scenario was at the restaurant NEXT to the Agency.